The retreat is now sold out. get on the waitlist below. Tired of being silenced by others and especially by your own inner critic? Want to get better at bravely standing up to authority and authentically speaking your mind? treat yourself to a day of self-care and empowerment on Saturday, July 29th! packed with learning and laughter, community and connection, mindfulness and manifesting, trust and truth. 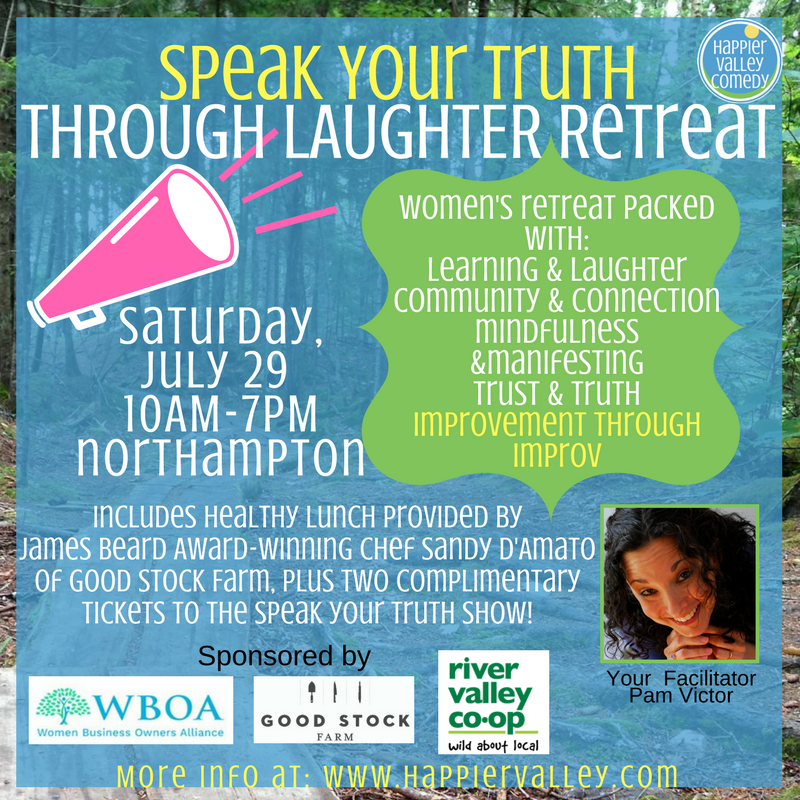 This retreat helps you learn and practice game-changing tools to bolster these skills in a supportive, judgment-free community of women using fun and active improv exercises to help you gain courage to stand up and speak your truth while trusting that You Are Enough. easy-to-learn, non-performance improv training exercises. have a blast with the THROUGH LAUGHTER workshops. a positive, judgment-free community of women who are there to lift each other up. Let's grow stronger together! And let's do it all using the exclusive "F.U.C.K. I.T." approach to personal growth. Healthy lunch provided by James Beard Award-Winning Chef Sanford D'Amato of Good Stock Farm! performed by professional improvisers from Happier Valley Comedy mainstage casts. Each retreat participant receives two complimentary tickets to the show to share with friends and family. This retreat is open to all who identify as women ages 21+. No improv (or other) experience necessary. Pam Victor is the founder and president of Happier Valley Comedy where she runs the Through Laughter program and a multi-level improv comedy school as well as producing regular improv shows in Western Massachusetts. Pam is the author of “Baj and the Word Launcher: A Space-Aged Asperger Adventure in Communication” and, along with legendary improvisers TJ Jagodowski and Dave Pasquesi, co-author of “Improvisation at the Speed of Life: The TJ & Dave Book.” A graduate of Smith College with a Master’s in Education from Iona College, Pam has received improv training from iO Theater (Chicago), Annoyance Theatre (Chicago), ImprovBoston, and from Second City teachers. ​Pam is a nice person. She would like you. "Pam's workshop fundamentally changed the way I think about improv (and life!). In just 2 days I went from overthinking, always judging myself (and sometimes others), and constantly planning my next move to being comfortable with the unknown and letting things happen and be discovered naturally. Pam's teaching style is calm, supportive and encouraging (without being over the top). She gave me permission to be myself, and then helped me realize that I didn't need that permission in the first place. I will remember these two days for a long, long time to come! For more about the whole Personal Empowerment THROUGH LAUGHTER program: www.happiervalley.com. NOTICE OF NONDISCRIMINATION POLICY AS TO STUDENTS: The Happier Valley Comedy School admits students of any race, color, sexual orientation, gender identity or expression, religious affiliation, age, ability, national and ethnic origin to all the rights, privileges, programs, and activities generally accorded or made available to students at the school. It does not discriminate on the basis of race, color, sexual orientation, gender identity or expression, religious affiliation, age, ability, national and ethnic origin in administration of its educational policies, admissions policies, scholarship and loan programs, and other school-administered programs.